The Aragon page is the main interface to the Aragon Online game. This shows you the statistics of your game and your region, and has an interface to the World of Aragon maps. The World map is 97 hexes by 97 hexes in size. On the left are Compass navigation controls which allow you to scroll across the world map, and to examine the more detailed maps. This screen also displays information on several subjects, and current Player and City data. You can scroll around the world map by using the compass icon. If you wish to see the entire World Map, clicking the World icon will display a thumbnail view of the World of Aragon, displaying the names of the major places in the world. 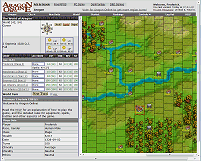 The Aragon world map allows the player to explore Aragon with their army by placing the cursor on the desired map location and clicking MOVE TO on the Unit Action Menu to the left of the screen. Then click the NEXT TURN button. The length of a turn on the World level is one week, and the current date is displayed in the upper left hand corner. As play begins, each player controls one Region, and the City within that Region. Clicking a hex, then using the Region button will display the Region map for that world hex. You can see the location of the cities in the Region on this map, if any. The Region is the area controlled by a player, or empty world hexes uncontrolled by anyone. Armies may move and encounter other armies on the Region level. The length of a turn on the Region level is one hour. Clicking a hex on the Region Map and using the Tactical button will display the highest detail map corresponding to that Region hex. This is the scale of map where the Development of cities is displayed, and where battles will be fought. The length of a turn on the Tactical level is one minute. The turn sequence in the World of Aragon corresponds to the three levels of detail. On the highest level, the Aragon map, turns are 1 week long. Each week your city data will be updated to reflect current income and expenses and developments will progress toward becoming fully built and productive. The next higher level of detail is the Region screen. Here turns are one hour in duration. Any units assigned to move on the Region map will progress toward their goal as far as they can during that time. If units are not moving, using region turns will rest them, restoring stamina and regaining spells. The highest detail level is the Tactical screen. Here turns are one minute in duration. Any units actions will be executed when Next Turn is clicked. This is the level where battles will be fought with other forces, so there are many more options available than the previous scales.